In need of a jacuzzi to complete your backyard but just don’t have the cash? Need a swimming pool for the little ones but tired of the cheap plastic ones popping and leaking all over the place? Look no further than [inexplorata]’s self-explanatory “Hippie-Redneck Solar-Heated Kiddo Swimmin’ Pool And Hot Tub“. The pool uses a six-foot-diameter metal stock tank, provided by a neighbor. After some liberal use of JB Weld, the tank functions as a makeshift pool on the cheap, but the magic doesn’t end there. [inexplorata] found a solar thermal water heater that someone was getting rid of and snagged it to heat up the water, which is almost a necessity for most parts of the Northern Hemisphere right now. A sump pump in a bucket handles water circulation, and [inexplorata] points out that the single water heater is more than enough to keep the water nice and warm (“hot enough to poach a rhino” is the scientific term used on the project page) so if you’ve got the means, this might be a welcome addition to the backyard! The build was posted on Reddit, the users of which had some helpful suggestions for improving the pool if you want to tackle this yourself. If you don’t have a solar thermal water heater, you could always make one of those too. The black box mounted between two garage doors is actually a water heater controller. The entire assembly is a conglomeration of hacks which [Simon] added to his garage over the last four years. We’ll give you a quick rundown, but the entire story is told in his blog post. Back when the house was built [Simon] was approached by the contractor who offered to throw in remote control for the garage door rollers for just 1500 Australian Dollars (about $1350 with today’s rates). That sounded quite steep to him. He managed to add his own remote control for about a third of the price. But there were a few missing features. Notably, a lack of a light that comes on when the doors open. He also didn’t like that the button inside the garage was on the motor, which is mounted quite high. Years later his water heater controller needed a firmware upgrade from the manufacturer. Check this out: they replaced the entire controller rather than flashing the PIC 18F2321 inside. What a waste! But in this case [Simon] snagged the old unit, which included several mains rated relays. He connected one up to a light socket seen above, and outfitted several illuminated buttons on its original enclosure. Now he has the satisfaction of a light that comes on with when the door opens, and shuts itself off after a preset delay. Now his daughter wants smartphone control. But that’s as easy as hacking a Bluetooth headset. [Chris] set out to build a monitoring system for his water heater. It doesn’t Tweet or send SMS messages. It simply lights up an LED when the water heater is active. The one thing that complicates the setup is that he didn’t want to pull any wire from the garage into the house. What you see above is the wireless setup he used to accomplish this goal. This is an electric water heater, so [Chris] patched into the 230V heating element feed. When the water heater is idle this connection is cut off. He used a transformer to step the voltage down to 17V and rectified it before feeding a 7805 power regulator. The rest of the transmitter circuit consists of a 555 timer driving the coil seen on the left. It is made out of telephone wire, with each of the four conductors inside connected together to multiply the number of windings. 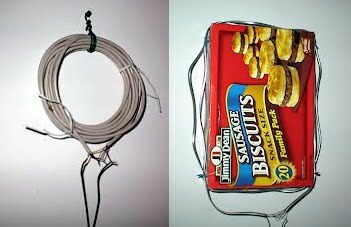 The box of breakfast sausages hosts the receiver coil. His hardware takes the induced current from that coil and amplifies it, feeding the signal to the base of a transistor responsible for switching the status LED. This works through the 6″ thick garage wall, although he did have to use a battery on the receiving end as his wall wart was injecting way too much noise into the system to work. [Peter Sobey] had a solar hot water heater installed in his home, which worked great until he relocated his kitchen to a neighboring room. Now a good bit further from the tank, the hot water reaching his sink was tepid at best due to the increased distance and temperature limiting mixer valve in the new heater. He installed a salvaged solar panel and water tank solely for use in his kitchen, but as the panel was located above the tank, he had to find a way to actively monitor and control the water temperature. His pump and valve system was originally driven with an off the shelf PICAXE-based controller, but he eventually got the urge to add a wireless display and control panel to the mix. A pair of Arduino Nanos run the show now, one of which resides in the pump controller box, while the other is used in the temperature display box in his kitchen. 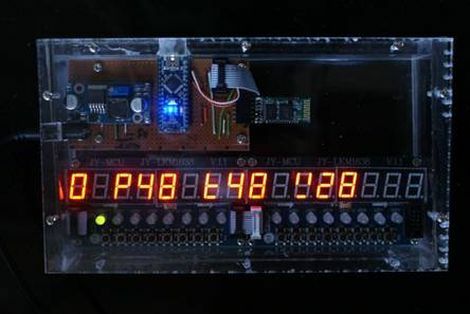 He uses a set of Bluetooth modules to link the Arduinos together, relaying temperature data and allowing him to send the pump controller manual commands if needed. He says the system works a treat, and he’s much happier with his homebrew controller than the one he used originally. When notes stuck to the water heater failed [Ryan] decided to whip up “the world’s most expensive 240V relay” using a servo, a real time clock and of course an Arduino. All in an attempt to save a buck or two thanks to LA’s “Time-of-Use program”. Using a protoshield Ryan soldered up a RTC module using the DS1307 chip. On board he added some LED’s and switches including a holiday switch keep the heater off, a next cycle button when you need some hot water and to hell with the expense, and a pulsing blue LED.. for no reason at all. The board flips the mechanical switch using a servo and piano wire, simple but effective. We wonder how many days/weeks it will take for it to offset its expense? Here’s a solar water heater setup that augments your home’s water heater instead of replacing it. The system monitors a solar collector panel on the roof for temperature. If the temperature is warm enough, a photo voltaic cell powered pump circulates cold water through the system. The heated water returns to the top of the home’s water heater. Unlike the warm-climate solar heater we saw earlier, this one can withstand freezing because it uses silicone tubing in the collector.